This is just a little thing I put together recently. 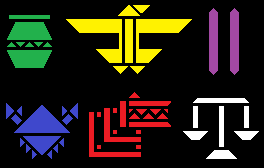 These are all insignias painted on the chest and forehead of individual manufacturing runs of SWATbots in the Mobian Chronicles universe. The robot soldiers are organized based on their production run, with members of the same series forming into companies, battalions, and so forth based on that. Individual robots are given callsigns based on their production series and the order in which they were made. The 13th SWATbot to be constructed in the Draco series would be named Draco-13, for example. These six insignias denote the Aquarius, Cygnus, Gemini, Cancer, Draco, and Libra series, respectively, though there are many, many more, all named for various celestial bodies or phenomena. I went with a mix of early Central-American influence and modern digital displays for the designs, which seem to go eerily well together. Interesting designs, and there is much truth in your statement. The designs are very iconic, and I can definitly see the early native influences you mention.